Jungle Red Writers: What We're Writing? Hank's Cat and Mouse and Cat Suspense! What We're Writing? Hank's Cat and Mouse and Cat Suspense! But one thing that keeps me going—I do remember when I felt nervous like this about THE MURDER LIST, and hurray, that’s now finished, the final final copy edits, finally, are all done. (Why are there always more typos?) So it proves it can happen, even though I worry every time. And so far, so good! THE MURDER LIST, a standalone, is a cat and mouse and cat tale. This time, a twisty triple triangle. You’ll see what I mean when you read it. Someone said it’s B.A. Paris meets John Grisham, and hmm…that sounds about perfect. Here are the main characters: Rachel North, a law student who always reliably tells you what she knows to be true. She’s smart, successful, and always does the right thing. She’s happily married to the faithful and devoted Jack Kirkland, a hotshot defense attorney. And her summer internship with the zealous prosecutor Martha Gardiner is sure to put Rachel on the fast track to a brilliant career. Problem is: Rachel is wrong. We never fight. Not in the past six years, as long as we’ve been married. Not even in the months before that. It isn’t that Jack is always right or I’m always right. Usually our disagreements are about things that don’t matter, so it’s easier and quicker for me to acquiesce. Jack’s a lawyer, so he likes to win. It makes him happy. And that’s good. But now on a Saturday morning in May, sitting face-to-face across our breakfast table in sweats and ratty slippers, we’re definitely on the verge of a real fight. This time, the fight matters. This time I have to win. “I forbid it,” Jack says. I burst out laughing—all I can think to do—because “forbid” is such an odd word. I take a sip of dark roast to defuse my annoyance and to clear the looming emotional thunderstorm. I know his problem isn’t my summer internship in the Middlesex County District Attorney’s Office. Jack’s impatience with me is fueled by the headlines he’s reading, news stories that feature his name. Jack hates to lose. Especially in court. And especially to Assistant District Attorney Martha Gardiner. My new boss. And LATER in the book…. “But—” Deacon Davis, hollow-cheeked and swimming in a long-sleeved shirt that had fit him three weeks ago, had the look Jack had seen on so many defendants. Confused. Defeated. The perplexed demeanor of someone watching the last train pull away from the station. A train that left them in a courthouse, seated in a folding metal chair at a pitted conference table at nine on a bleak Wednesday morning. Destination possibly life in prison. “Ten minutes, sir.” The conference room door had opened so quickly, the sound of the sharp knock on the wood had not quite faded. And LATER in the book! Martha stepped back from the demilune table in her hallway, tilting her head, assessing her newest arrangement. The pale-blue hyacinths and white tulips and spiny green ferns, fresh from her tiny garden, were duplicated in the ceiling-high mirror behind them, a mirror that had graced the entryway to her Beacon Hill apartment since her grandparents had owned it in the days when the Esplanade’s now-iconic Hatch Shell was brand new. Back then, though Grandpa Leggett had signed up to fight Nazis, his father’s influence kept him desk-safe in Washington at the War Department. Through her lattice of lavender-tinged windows, originals, Martha could see the early evening sun streaming though the elm trees on the green expanse of Boston Common, couples and puppies and children winding the same paths where Abigail Adams strolled, and then Lucy Stone and Margaret Fuller. Those women had made a difference, and she would, too. She plucked a tulip from behind a stubborn green hyacinth leaf and replaced the flower front and center. The flowers were from the square of green courtyard behind her building, hardly a garden, more of a patch, the one place she felt responsibility only to nature. Sometimes, when the wind was right, she could smell the brine of the harbor, or see an optimistically wayward gull headed for the Atlantic. The tulip shifted, and now a fern blocked it. Using her thumb and forefinger, Martha pinched off an offending leaf. Perfect. Gardiner the gardener, her father used to joke. When he could still joke. The graceful bay windows, her inherited Persian rugs, the polished mantle over the fireplace. The lines of silver-framed family photos. She’d lived here since she was a girl—after her college dorm years in Cambridge, of course, but after it had seemed more sensible to stay here, while her mother was sick and then her father, and then, alone, she kept the place to herself. Familiar and orderly and set in its ways. She refused to think of it as her personal metaphor. She used one of her family wineglasses for this evening’s cabernet—who else would she use them for?—and wondered, yet again, about her choices. No pets, no friends, no hobbies except for her patch of green. Only . . . She took a deep breath and looked into her remaining wine. Only justice. The file lay open on the supple saddle-leather couch, tempting her, yet again, to read the documents. What did she think she would find after all these years? Most people kept scrapbooks of their wins, their glory days, to reassure themselves when they failed. Martha kept files of her losses. To remind her of her failures. To prod her to prevent them. So much character revelation in these small excerpts. You have my attention!! Congratulations on yet another amazing read. Oh, my . . . I really enjoy cat-and-mouse stories filled with suspense and now that we’ve “met” the main characters, I can hardly wait to read the book to find out what lies ahead for Rachel, Jack, and Martha . . . . Thank you! I never have an outline, so it is always a surprise to be me, too! Oh how I wanted the excerpts to continue! I can't wait to see where this triangle of characters is going. I feel like I've already learned some insightful information about them. Hank, you always give readers great characters and a thrilling reading. So great to hear! Yes, I hope you love it... each one of those character traits matters! Xxxxxxxthank you! Fabulous, Hank! Can't wait for the book to come out. One of these days I will tackle multiple POVs, a challenge I haven't met yet. Thank you! But I think it is equally difficult to write for a single point of view— A lot of information to impart, and it only can come through one set of eyes. so every technique is a challenge, right? Oh Hank! If only I could go and grab me a copy right now! But I have to wait how many months? I suspect you spent many hours over dinner "interviewing" your husband to get the legal stuff just right. Looks like you did! I want to know more about Martha. That must have been fun (and probably nerve-wracking at times) to follow the threads of each character throughout this story, Hank! I think this book is going to be a great ride for your readers AND a huge success for you! It was a surprisingly difficult book to write, actually. It’s always difficult, but this book changed so much in the process. It took a lot of shuffling to get the twists and turns and motivations to fit. It’s always difficult, but this book changed so much in the process. It took a lot of shuffling to get the twists and turns and motivations to fit. I wasn’t sure what the final picture would look like, and I gasped in surprise when I discovered it. Well, that was weird! The dictation software inserted in the same sentence twice. Weird! What an ominous final line... taken with the title of the book... Oh my! Dying(!) to read this. Well let me think… Is there a book that I would like to read in exchange??? Wow, three POVs! I can't even imagine writing that. I'm looking forward to reading it, Hank! That is so interesting, Kathy! It is the most fun thing for me… And more natural than writing a book in just one. What do you all think about that? Do you like to read multiple points of view? I do like reading multiple POVs. As a writer, do you plan the overall plot first or do plan each POV then combine them? How do you decide who narrates each chapter? I always know that YOU, Hank, will pull everything together. Meanwhile, as I read your books, I need numerous cups of chamomile tea as the suspense builds! I’m stocking up on more of it as I await The Murder List! I Have an ARC!!! and I can tell everyone the surprize (someone grabs me puts their hand over my mouth and drags me away..) okay back.. I can tell everyone it is marvelous. I will be posting my review later today on Goodreads -- unless the cat throws up again. Hank look for another extended book tour this one is great. Oh. wow, Hank. Just from these few paragraphs we already know SO much about these three characters, especially Martha. Privileged, rigidly critical of herself, with exquisite taste and artistic sensibility. But deeply lonely. Whoa. Well done. 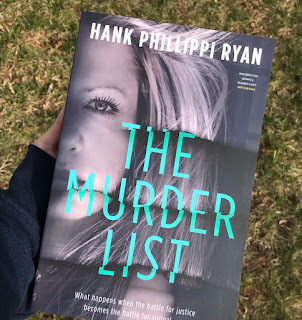 Hank, coincidentally, Catriona McPherson is on Criminal Minds today, and she says she didn't know what one of her books was about until page 280. So you're in good company with your WIP! SO interesting! Yes, it's aways a big relief when the story reveals itself. I'm never quite certain it will. Ooo, fabulous. I can't wait! Thank you, dearest Liz! See you soon! WOW ! You already got me with Rachel. Two more were like " du bonbon " . Looking forward to the Murder List. Three lawyers? Or two and a law student? Who could possibly be lying? I seem to have ordered this before Christmas. I just burst out laughing! Never thought about it that way. :-) And thank you! Whoo. A preorder--HURRAY!! This is SUCH a great thriller that's getting a many-thumbs-up-blurb from ME as soon as I, um, write it. I love the characters, the twisty mystery, and the even twistier relationships that keep you constantly wondering who's lying to who - and why. Actually, Hank, I think if I polish this comment up a bit, it could be my blurb! SO intriguing, Hank!! I can't wait to read it! And I am continually amazed by the fact that you can write these wonderful twisty books when you don't know where they are going! I really liked the synopsis of the book. Sounds like a lot going on, looking forward to reading. What an incredibly wonderful thing to hear! Wow. Thank you ! The title alone grabbed my attention right away, then, after reading the basic premise of the book and the excerpts, I am totally hooked! Thanks so much for the chance to win an review/ARC. This is fantastic! Each character has a unique and compelling voice - I am completely invested. Bravo, Hank! Sounds great!! Thanks for these excerpts ! Oh so wonderful to hear—thank you! Choosing excerpts is a true science! Sounds intriguing and interesting! Looking forward to reading this!! So much info here. Very intriguing. Can't wait to read the whole thing. Thank you—and pssssst... even a few clues! I loved these excerpts and am especially looking forward to discovering more about Martha Gardner! This is SO interesting to hear! I am so intrigued by all of the choices...and all of your comments. Fascinating, truly..
And the winner is Michelle L! (US only, please...) . email me at h ryan at whdh dot com! HURRAY!! LOVE you all madly, and crossing fingers. I am so grateful for your wonderfully kind words and support. Too late to enter, but not too late to tell you that the excerpts left me wanting more, and thinking that Rachel sounds like she'd be a wonderful friend, but the kind I'd need to shake a few times, and give a big sister talk to. I want to read this book! I can't wait to read the rest of this! I barely know your Rachel yet, but I'm already rooting for her! She seems like the type who has always been easily walked all over, but is starting to develop her back bone. Already hoping she's not too easily duped by her new boss! If she really is the type to be easily duped... Waiting (impatiently) for more! Great work! I can't wait to read it. I hope that I will win a copy.